Harry is a cute little guy looking for a forever home. Could you give him that home? 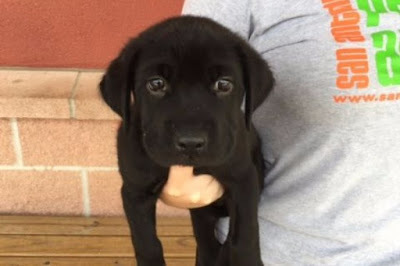 Harry is a 2 month old neutered Lab blend. I knew I was going to love Harry the moment I spotted his in his kennel. He has that "look", the Family Dog seal of authenticity...imprinted in love letters on his face. I am so glad I took his out at the end of my shift. How peaceful our time was in the yard...a real blessing. Harry walks beautifully on the leash, not forgetting to do his business. He does not seem to mind little or big dogs encountered around the block. He is fine being approached by passersby who comment about his ruffled neck piece. What an easy going gal! He is beautiful and has been so well cared for. He might be a tad chunky, but that makes his even cuter and more lovable. Harry comes at once when called, sits nicely on command, gives paw (I wish my dog did), displays the sweetest and biggest smile, and looks at me with eyes that melt my heart. He so enjoys caresses and hugs. He is the mushiest of all...I so love him. You've got to meet him. It is an absolute must. Harry is said to be 2 month old, a perfect age to adopt a pet, mostly one who has already such great qualities. Come and meet him soon at the San Antonio Animal Care Services and make his yours, all yours, the jewel who will brighten your life. contact info@sanantoniopetsalive.org or call 210-370-7612 (email preferred).